The Addax are the most well adapted of all desert antelope, shaped like a reindeer, they have short necks, high raised up withers and straight backs as well as rounded backsides. They have what looks like a brown toupee that sits on their forehead, and a white mask of hair that crosses their nose. Their coats change color from summer to winter, being white in summer and changing gradually to brown during winter, although winter on the Sahara is not ordinarily cold, so the reason for the color change is not known. They have adapted themselves well also to desert travel, with very broad flat hooves that help them to walk across the sand dunes with ease and not sink into the sand. These hooves distribute their weight better, much like a snow shoe does for a human. Both male and female have very long horns that slant backward and spiral in small twists upward. The Addas live in some of the most remote areas in North Africa, in sandy, stony desert regions that are quite far from water sources. They are active in early morning and later evening, avoiding the higher temperatures of the day by remaining in whatever shade that is available to them. The Addax is an old species, which has been proven by stone carvings depicting life in ancient Egypt that show images of the Addas, and also show that addax were kept in large numbers, semi-tame in stables as if they were goats, as recently as the 14th century in this arid dry area. The female addax reaches maturity about 18 months old, while the males don’t until they are about 3. The females give birth to just one calf after a gestation of about 9 months, quite similar to human gestation. The Reddish brown infant will be born in late winter and early spring, and although they are hidden by the parent for the first six weeks of their lives to protect them from predators and humans, in a hidden area, they are considered precocial, which means early developers. Although the mother will always remain in close proximity to their calf, at birth Addax calves have open eyes, can stand and walk within an hour and weigh in at around 10-15 lbs. 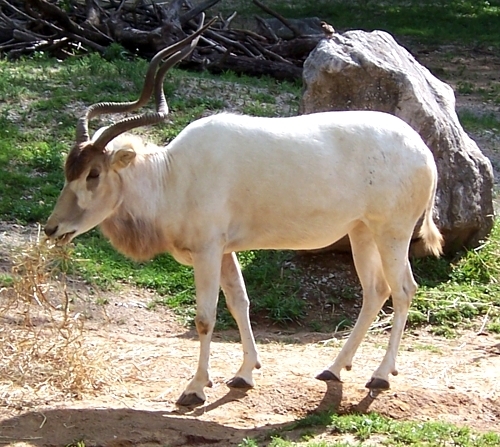 Addax feed on grasses, shrubs and succulents. They get their water requirements from these plants and do not need to drink free water. But they will drink water if it is available to them. Prolonged droughts and continued war in the region where addax live coupled with reduced numbers had until very recently pushed this species to the brink of extinction. In fact, there are more addax in captivity in zoos in North America and Europe than there are currently in the wild it is estimated, and those zoos are working with range state countries to develop reintroduction programs for this endangered antelope. 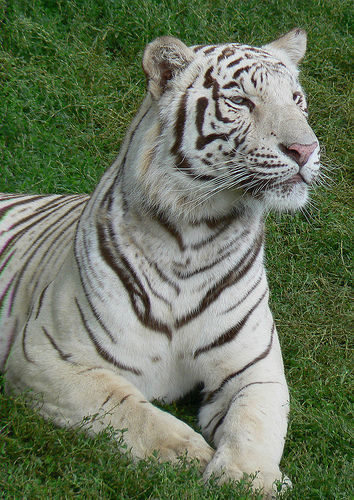 Reintroductions have occurred in Tunisia and Morocco into protected reserves.